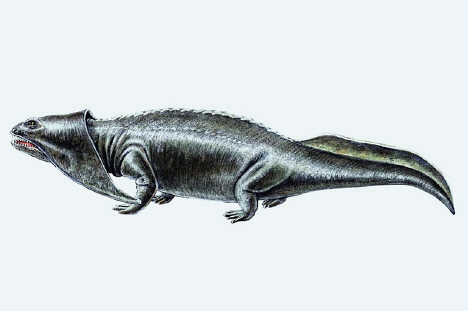 Diplocaulus was a genus of amphibian that lived during the Permian period between about 298 and 251 million years ago. Diplocaulus was about 3 feet (1 meter) long, and had an unusual boomerang-shaped head. It is not entirely clear what the purpose of this head shape was: it may have made it harder for predators to swallow, it could have helped the creature glide through the water, it could have been used to attract mates, or perhaps some combination of these. Diplocaulus : a study in growth and variation. Fauna of the Upper Vale and Choza: 6, Diplocaulus, 1952, Fieldiana: Geology, Volume 10, Number 14 :.